With a stunningly high altitude, Medlow Bath is one of the smallest villages in the Blue Mountains region, but it comes with a plethora of enchanting attractions that will undoubtedly thrill visitors. From gloriously green acres of land to hidden caves, it is also known for its walking tracks and gushing creeks. Located on a gloriously high cliff, the Hydro Majestic Hotel is more than just accommodation to locals and visitors: indeed, this historic building is one of Medlow Bath’s most reputed landmarks. Heritage-listed, this hotel is particularly known for its unique blend of architectural structure, with particular emphasis on Edwardian and Art Deco styles. Extremely eye-catching, the Hydro Majestic Hotel features a Las Vegas style casino dome that was especially flown in from Chicago. 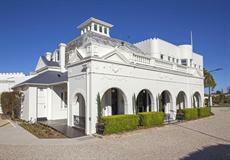 First erected in 1902, the Hydro Majestic Hotel used to accommodate VIPs in the likes of W.H. Hargraves, one of the most important trustees in Sydney’s biggest museums. While it used to be a single-storey building back then, new floors and wings have been gradually added to the building, transforming it into a uniquely contemporary structure. In fact, the complete hotel consists of three different buildings that were joined together. Even if you’re not staying at the hotel, it is possible to book a tour of the place and admire the stunning architecture for yourself. 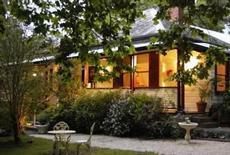 Medlow Bath’s main hotel also includes several restaurants to tantalize your taste buds. Right behind the hotel is found an energetic bushwalk that provides you with a panoramic view of the area. Not far from Hydro Majestic is found Point Pilcher, a bushwalk known for its hidden cave where Frank Walford, the former mayor of Blue Mountains used to camp out back in 1920. Historians will undoubtedly relish in the numerous objects and artifacts that have never been moved from the cave. These include old newspapers, shelves with cutlery, old ladder, tins of food and the likes. A small creek is also found not far from the cave, where the mayor would probably have sourced his water. Because the creek is flowing with fresh mountain water, you can enjoy a cool drink or a refreshing dip after your walk. Not far from the cave is another lookout point which offers a bird’s-eye view over Medlow Bath and the Blue Mountains park. Brimming with a variety of historical landmarks, Medlow Bath has quite an impressive elevation of 1050m, which is ideal for anyone who wants to enjoy a bird’s eye view of the surrounding regions. Because it has a very small population of 462, Medlow Bath is oozing with old-school charm. Featuring friendly locals who are more than willing to share the aboriginal legends surrounding the landscapes, this village offers quite a lot in terms of restaurants and entertainment. As far as accommodation is concerned, most visitors choose to stay in the Hydro Majestic Hotel, but smaller inns and motels are also included. Around 108kms from Sydney, Medlow Bath can be reached in roughly 128 minutes trip by train.